Steve Spangler Science and Sonic America’s Drive-In have teamed up once again to bring a little science and fun in their Sonic Wacky Packs Kids’ Meals this summer. 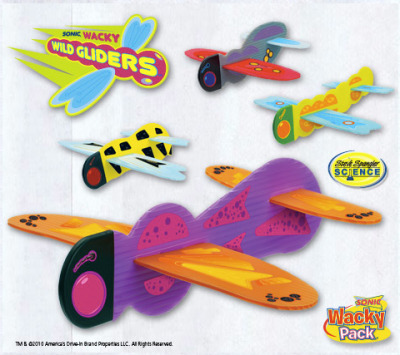 Wacky Wild Gliders are fun airplanes that feature fun facts about one of four insects. Kids will love assembling their insect glider, decorating it with the included stickers and then heading outside to explore the properties of air, motion and gravity. They will also learn a little bit about the insect on the glider. Collect all four insect gliders at your local Sonic – Ladybug, Bee, Dragonfly and Butterfly. You can also visit the Sonic website for more information on the gliders as well as a coloring sheet (pdf) to print and decorate.